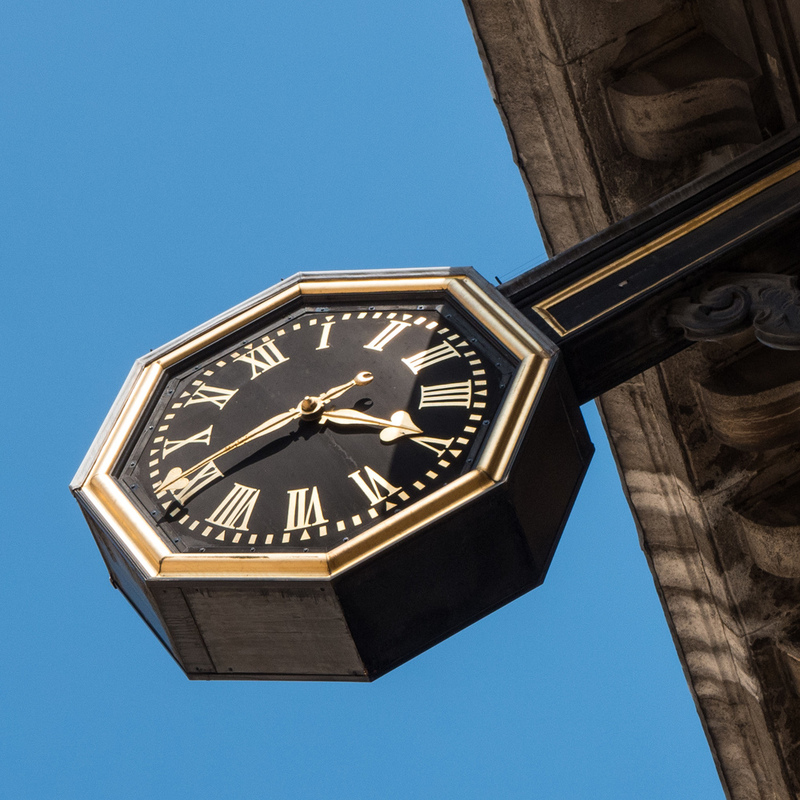 I've really enjoyed doing the research for my City of London Churches project. Each week I look at the map on the Friends of the City Churches website to see which ones I can get to during my hurried commute between Liverpool Street Station of Bank tube station on a Tuesday morning. Tuesday comes and I invariably find myself thinking, "There can't possibly be a church hidden away here", only to round a corner and find an architectural gem. 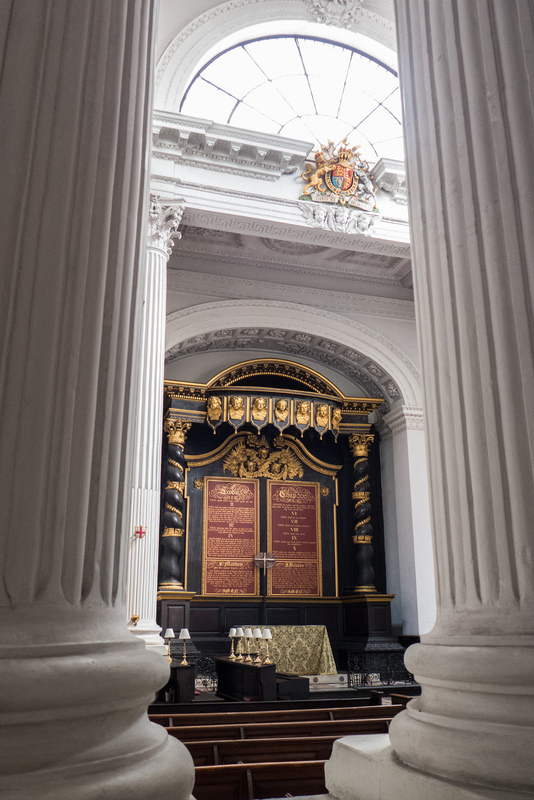 My destination this week was St. Mary Woolnoth, in King William Street, just a stone's throw from the Bank of England. 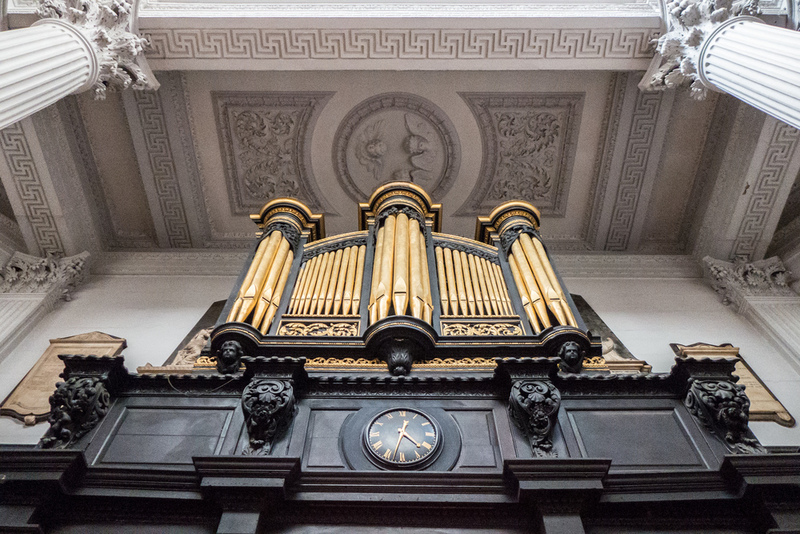 Many of the city's churches were built but Sir Christopher Wren but St. Mary's is the work of one of his pupils, Nicholas Hawksmoor. 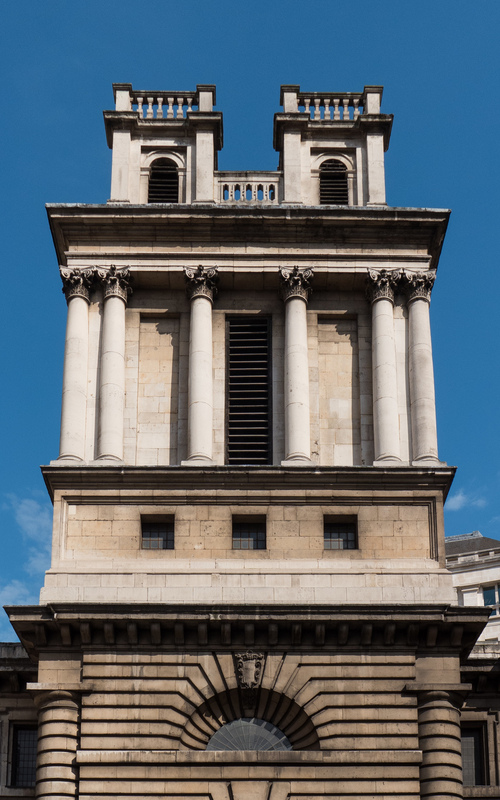 Hawksmoor is perhaps best known for his designs for the west towers of Westminster Abbey but he built a total of six churches in London, including St. George's in Bloomsbury and the church of St. Alfege in Greenwich. Unlike many City churches, St. Mary's was blessed with a reasonably open plot on which to be built - so many churches of the same period are squeezed into tiny gaps between pre-existing buildings. That said, it is still relatively compact, although the light, airy interior gives a feeling of space when you go inside. On entering you are greeted by a dark wood high altar which is embellished with plenty of gold leaf. In many spaces this would become a dominating feature but Hawksmoor prevents this by illuminating the church from above with four semicircular windows. The soft light from these windows create a magical atmosphere and the use of multiple white painted pillars for structural support and a highly carved ceiling gives the church a remarkably light and open feel. Unusually, I ended up visiting St. Mary's in the afternoon (a delayed train prevented me getting there in the morning) and as a result the church was surprisingly busy. Various people visited to pray and admire the architecture and after a few minutes we were joined by the church organist who set about doing some practice on a suitably rousing piece of organ music. In a corner I found an artist drawing the church. This elderly gentleman turned out to be the painter Anthony Eyton who told me he was drawing it to make sense of the architecture. He's 91 years old now but still working and these drawings are the preparation for an exhibition on the Hawksmoor Churches which he's putting on in Islington later in the year. He was a delight to talk to and it only seemed right that I should take his photo as he had included me in one of his drawings as I meandered around the church!